Wolverine has earned their place in the community because of this game. Another game I have seen go from the ground up is Front Office Football. I have done this from the peripheral, but have witnessed a game with a more solitary vision, along with a community fiercely dedicated towards that vision, build up a game that plays a hell of a game of football. The knock there is that it, well, it’s ugly. (This is being remedied with the merging with OOTP.) And that it doesn’t offer enough choices. Wolverine offers many games, in virtually all sports. It’s crowning jewel, though, is Draft Day Sports: Pro Basketball. It’s Gary’s first love, one he has seen through since the very beginning, back in 2005. I remember that version well; I played it constantly. It is his labor of love, the one that will always get the ideas that he’ll carry with him to his other games. This year’s version, DDSPB18, offers more narrowed tweaks than in years’ past. The goal here is to build on an already stellar product, and continue to make the experience of being a pro basketball GM or coach as authentic as possible. Did he do that? I’ll tell you in a few paragraphs. I will tell you that the one thing lacking with Wolverine, and this bothers me, is the amount of people in the community. There are not enough of them. The community is incredibly dedicated, just as much as at OOTP or FOF (naturally, there is a lot of cross-championing with these companies; while they are competing for your money, they also recognize how they help one another). What the company has done to offer as many games, across as many sports, as it does…in my view, it deserves to get more traffic than it does. Hopefully, that day is coming, and soon. I’ve jumped off my soapbox. 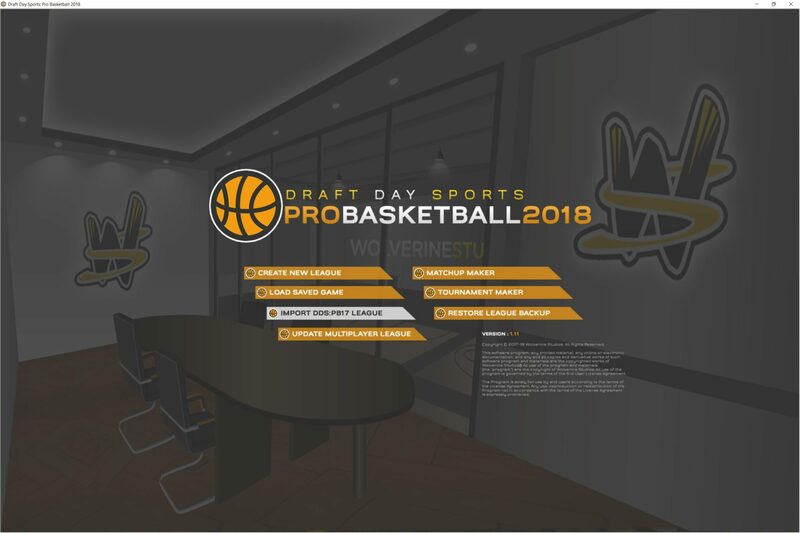 Let’s jump into the review of Draft Day Sports: Pro Basketball 18. Wolverine games have a distinct look that has remained constant through their games. What you get in one game, you get in all of them. It’s clean but packed with information, and a system that works. Last version, a menu was added to the top of the screen, allowing you to move throughout leagues, and giving you clickable logos on the horizontal bar (on a phone, it would be a notch) to allow for easier access to screens. Wolverine took one more step this year; DDSPB18 has more screens accessible from the bar. The main additions are for the depth chart, rotation, and trade screens. These are integral to the daily functions of running a team. Looking back, it’s a surprise they were not in last year’s version. But they are a welcomed addition this time around. There are still two reasons to ding Wolverine’s layout. One is the amount of unused space. In the screen above, everything is placed well…but there is a lot of real estate that could be utilized for information. This is not for everyone, which I understand. I am spoiled by OOTP’s information overload, which also is not for everyone. The other reason is one that may not be a reason coming up. Windowed mode. A conversation between Gary and I led to an attempt at windowed mode with the upcoming Draft Day Sports: Pro Golf. So, there are avenues being taken towards allowing users to multitask and utilize other apps and programs while using DDS games. 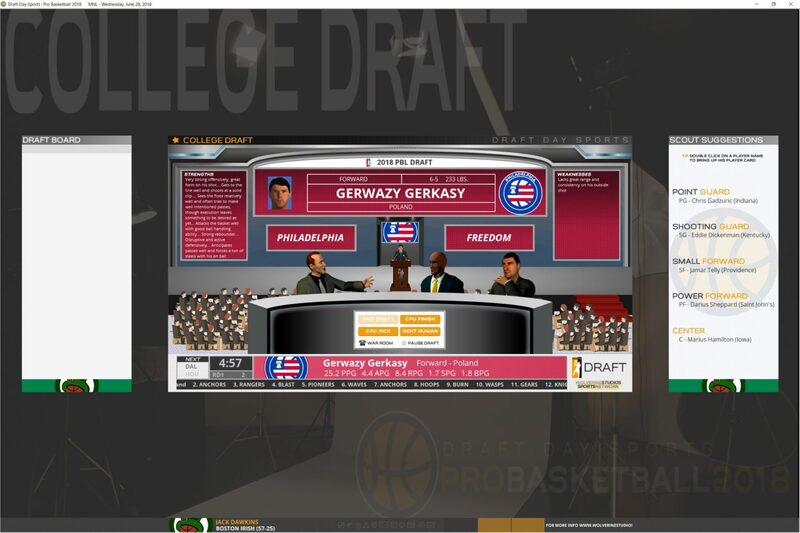 Within your league, you can further change some options, including inflation and the option to let international and high school players enter. You can also link your league to allow international and HS players to enter. Verdict: It’s a clean look and feel. The added functionality of the horizontal bar is a plus. The game still has some slight drawbacks that are not for everyone, and while DDSPB does not have windowed mode in this version, I believe I will not be harping about it in the future. The usual fare is here, with a couple of additions. 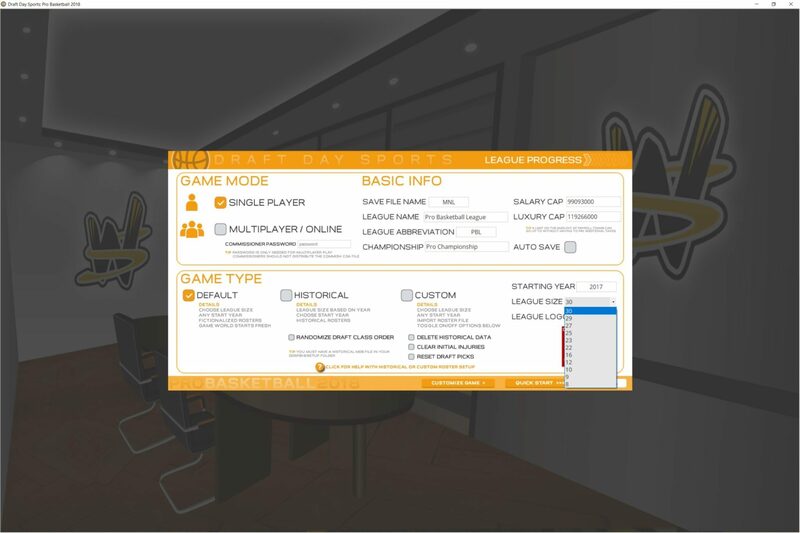 You can customize many things about your leagues, from league size to location, add in Euro leagues. 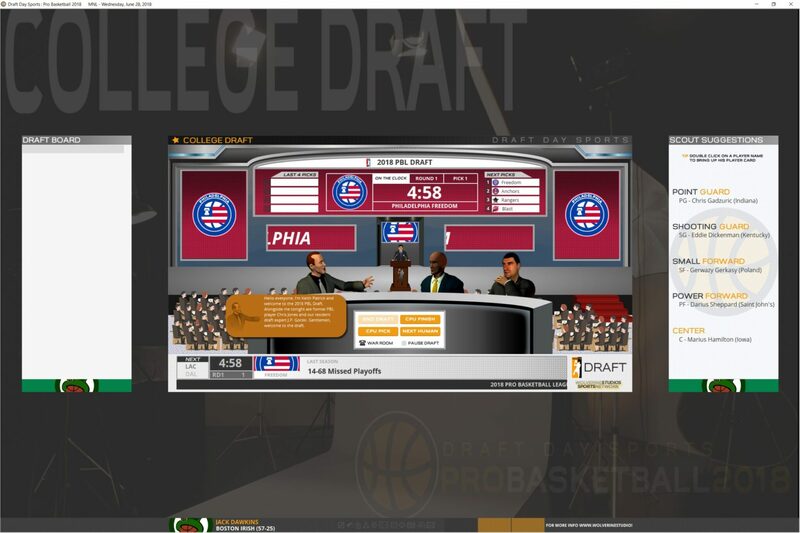 Within your league, you can further change some options, including inflation and the option to let international and high school players enter. You can also link your league to allow international and HS players to enter. It’s pretty standard, but offers the user many playable challenges. A few big things come into play here, and I am working slightly backwards on this. First, you can import games from DDSPB17. This is big for Wolverine, as it was not an option in the past. Another new feature is the Tournament Maker. Wolverine brands this as the “sequel to Matchup Maker”. I’d consider this more of an evolution of that feature. Here, you can grab teams from a database, and set up a 16-team tournament. It’s pretty straight-forward, but it is a pretty great feature, especially if you dabble in hypotheticals or sports arguments. Or if you like to play out tournaments. Or if you’re someone who prefers them to seasonal or career play. I know it seems small, and could get overlooked in the grand scheme of all things gaming, but these are the kind of additions that make a more well-rounded franchise. Wolverine, and DDSPB in particular, has always felt like a game that swung for the fences with every new feature. That is fine, especially early on. But this change is welcome, and I hope it continues. Kudos to Gary for adding in more subtle features that enhance the overall game. My only nitpick is one I have wanted for years, one that Fast Break Pro Basketball has; that is the ability to play out a full historical league, one that adds in expansion and correct geographical and NBA formats over time. (You can now, but only back to 1976, and the NBA/ABA merger.) I would love if the game used the Lahman Database. And expansion is not available for leagues under 22 teams. I hope that is something tweaked in the future; I believe this is the next big thing Wolverine should implement, actually. The ability to produce replay leagues, and allow for users to create a historical-fictional setup, is the next frontier. Verdict: The additions DDSPB18 gives the user enhance what was already a solid foundation. Yes, there are a few caveats (see the last paragraph). Overall, what the game gives the user is pretty great. This is where the game shines. Last version, Gary tore down the engine, and built the game around system and chemistry. Instead of hording the most talent (of course, talent helps), you had to build the team. Anyone who has ever played basketball, whether it be pickup or for any organization, knows that the most important thing about a successful team is the blend of talent, chemistry, and methodology/system. DDSPB18 builds on that, offering tweaks and additions to enhance the experience. 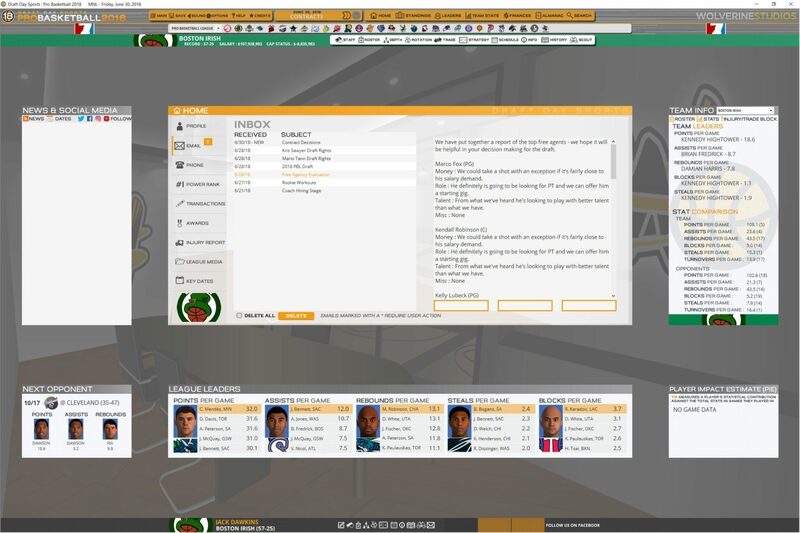 For instance, two-way contracts have been added, giving the user more flexibility to build young players. 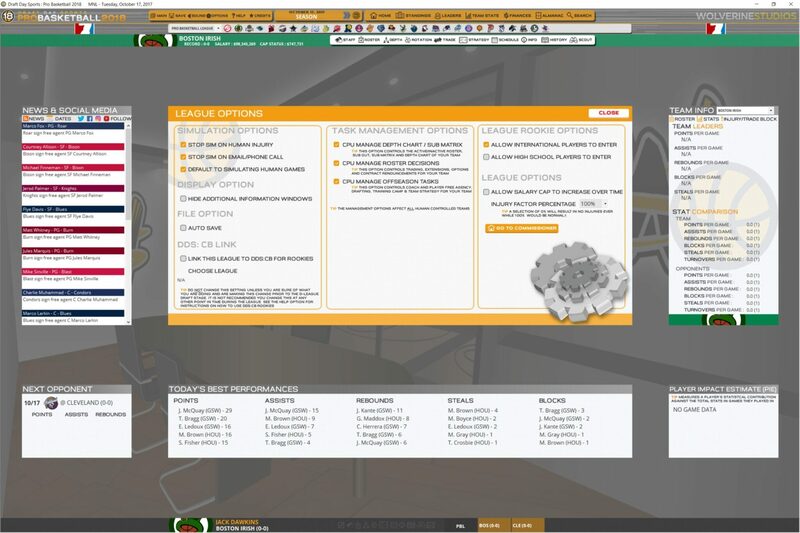 You also have the option to control your team’s D-League affiliate, which allows for you to totally oversee your entire franchise. A new injury system was implemented, making it more geared towards real life, and giving you more options and puzzles to solve as you navigate your team’s season. This is a big improvement over previous versions, and should add much more realism to your experience. There are also some additions made to stat and rating tracking, allowing you to see how a player has progressed (or not) over time. 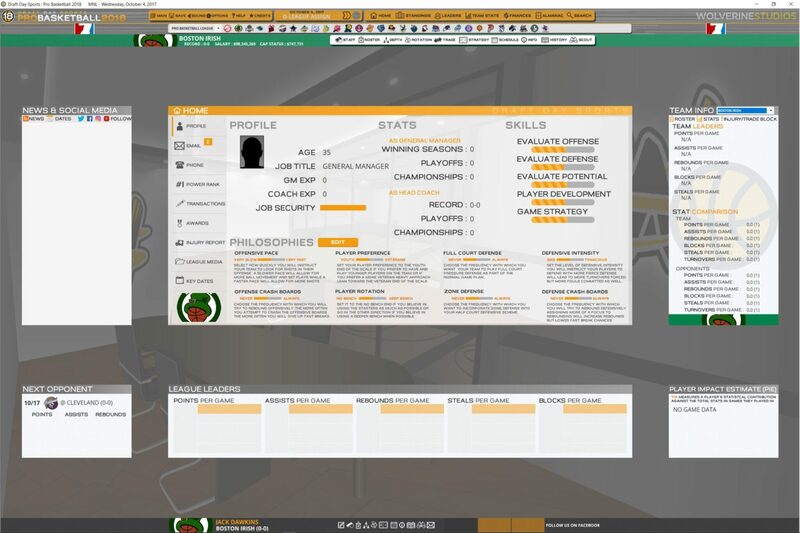 Coach and GM hiring history has also been added, and the defensive stats that found its way into previous versions made a comeback in DDSPB18. This was due to the clamoring from the community for them. Come on, it’s a sim basketball game. Of course it’s a full-on nerd community (as someone who revels in this, this is said in the most loving way possible). Finally, there are some free agency improvements, one that will help you better plan your offseason. Prior to the draft, an email detailing the league’s top free agents, as well as what they are looking for, will make its way into your mailbox. This will allow you (if you are playing with GM capabilities) to try and get a star player that might be interested. You might also find out who has an affinity for playing with a particular player on your team, giving you a leg up on the competition. Things like this give the user a better overall experience. I hope that it gets fleshed out and made a little prettier in the future, but this is a good start. There are also some improvements found if you want to build your roster from scratch at the very start. Before, finding contracts was a bit cumbersome. Now, all of the initial contracts are found on the grid before you draft them. So is your team’s salary cap total. This allows for the potential for better planning at the outset. Why potential? You could still blow it anyway. It’s your franchise, after all. One thing I would like to see built up now is the almanac and how information is presented. Since it is still a direct competitor, I will cite FBPB. The DDSPB almanac is functional; however, FBPB allows for you to sort through every player in history (or just retired or active players; you can separate them). You can also sort through transactions into its various types. I wanted to see what kind of trades there were during my season; however, I had to skim through all transactions in order to do this. Overall, it gives you the information you want. However, these little nuances will turn this section into an absolute powerhouse. It won’t be what OOTP gives you, but it took many, many versions for OOTP to get there (as well as some third-party love). Of course, my favorite part of this game is the draft. This game brought me a particularly great #1 pick. Verdict: This is still the breadwinner of the franchise. DDSPB plays a beautiful game of basketball, and the ability to coach a team is felt here. You can sink a team by adding the wrong player…or push it over the top and turn yourself from perennial runner-up to full-blown dynasty. The power of your decisions is made apparent here, more so than nearly any other game out there. It is there with Front Office Football, Fast Break College Basketball, and Football Manager as the Mount Rushmore of Feel Your Power Games. Eh. This is not Wolverine’s strong suit. It never has been. It also has never been a feature used in the basketball community much, which is always a surprise to me. I am not going to spend much on this, because there is not much to spend on. The biggest wish I have for this game is the same wish I have for OOTP, FOF, DDSPF, well…any game, really. Head-to-head play. The first to figure out how to implement this will find a gold mine. Verdict: I’m not going to ding Wolverine for focusing on other aspects of the game. For people who go down this road, you’ll be happy with the advancements made in all facets of this game. You will get an immersive experience, one that puts you at the forefront of running a fake basketball franchise. To do so with friends over the internet? Bonus. This is the best thing about the game. You might not have quite the limitless opportunities to create a league as you’d have in, say, Out of the Park…but in basketball terms, you have as much opportunity as can be afforded you. You can unleash your full nerd in this game. There is one drawback to this game, in that it can become a clickfest at times, especially if you want to get through some parts of the game (for instance, if you’re a coach only, and want to get through free agency). I’d love to see a feature implemented that will speed this up somehow (like a Sim To Date or Sim To Season feature). This game is incredibly fun to play. Virtually any way you can come up with to construct a basketball team, you can do that here. You merely have to deal with the consequences of your actions. Verdict: One of the most fun games available to play, you’ll find yourself trying to build the best team possible. Or trying to replicate the 96 Bulls. Or the 15 Warriors. Or the 16 Thunder. Or the 2001 Lakers. Or the Run TMC Dubs of the early 90s. Or the 1993-94 Knic…maybe you don’t want to go that far. However, you can construct your roster, and your style, in virtually any manner you want. You want control over your experience? DDSPB offers that in a way almost no other game can. Overall, the same thing I said about DDSPB17 holds true about DDSPB18. For the ability to coach a team, or run a basketball franchise, no game does it better. Wolverine has earned their place in the community because of this game. It deserves more of a share of your time, and a bigger slice of love than it gets now. The community it has is fierce and dedicated. But, given what this game gives you, it feels too small. Wolverine knows what it does well, and it definitely delivers on that. With DDSPB18, it is beginning to expand on what it can do. Anyone who comes across the game will benefit from that, now, and with DDSPB19. And 20. And so on down the line. Do yourself a favor. Get this game. Be prepared to spend a lot of time playing it, and feeling the ups and downs of running your team. That is why we play, is it not?